The tablet market really took off when the original Apple iPad launched in 2010. In the beginning, it got a lot of media attention and generated a lot of consumer interest. Google’s answer to the iPad was two new versions of Android, Honeycomb and Ice Cream Sandwich, with full-fledged tablet UIs. But Android devices like the Nexus 7 failed to make inroads in the tablet market, and as smartphone screen sizes increased, tablets gradually lost their sparkle. That tablet market’s overall growth in Q3 2017 dipped 5.4% year-over-year, marking the twelfth consecutive quarter of annual decline. Jitesh Ubrani, senior research analyst at IDC, said that buyers expressed a preference for affordable tablets across the board, even in the case of Apple’s iPad lineup. 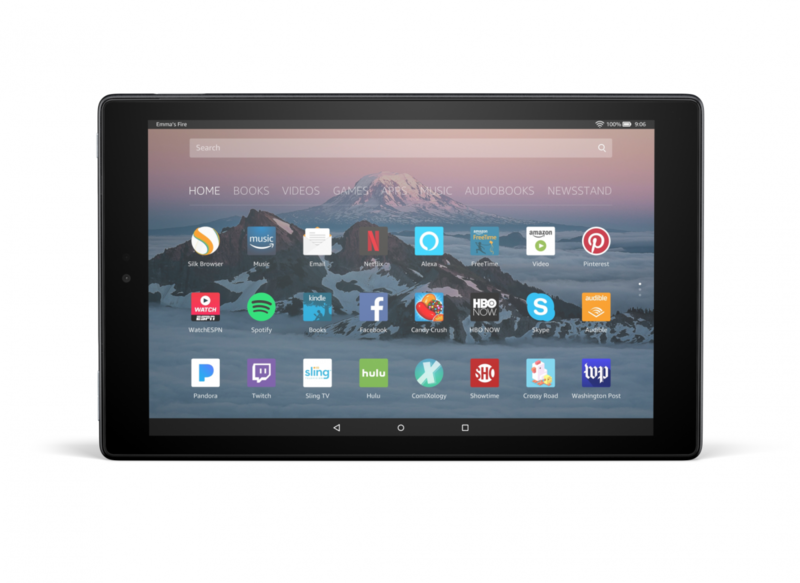 He added that many of the market’s most popular low-cost tablets were purchased as replacements and that first-time tablet buyers are becoming harder to find. One contributing factor is slower-than-expected growth in the detachable tablet market. Apple and Microsoft are the only two vendors supplying devices in the category, and other PC vendors have so far focused on convertible PC form factors. Market momentum has steadily shifted away from the latter toward the former over the course of 2017. Despite the tablet market’s declines, Apple still has a leg up over its competitors. The lower-priced iPad and the newest version of iOS, which introduced PC-like features such as split-view multitasking and drag-and-drop pasting, helped the company to cement its first-place position. Still, lack of support for legacy commercial software and strong offerings from competing vendors has “prevented iPads from becoming the primary computing device for the masses,” according to IDC’s report. Samsung’s tablet portfolio accounted for less than 10% of shipments in the quarter, despite a wide range of detachable tablets with multiple screen sizes and operating systems. The affordable Galaxy Tab A and E series helped it hold onto a second-place second position, and the company has a premium image thanks to high-priced tablets such as the Galaxy Tab S3. But it could face “long-term issues” as rival vendors “offer products at a better value,” according to IDC. Amazon ranked third in sales for Q3 2017. Its strategy in the market was to price aggressively, leveraging Amazon Prime to sell its tablets at prices as low as $30. That helped boost the company’s shipments by 38.7% year-over-year, IDC’s report states. 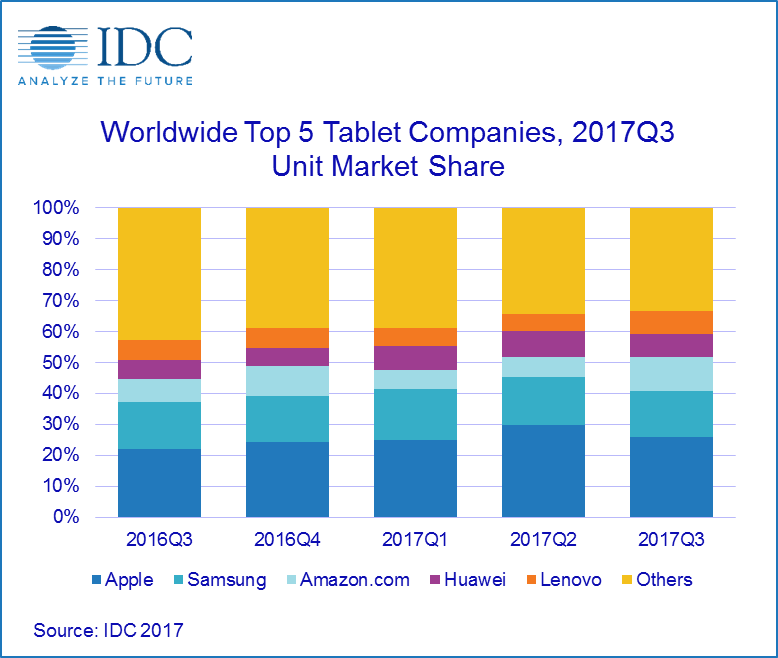 IDC also posted a detailed breakdown of tablet shipments by vendor, which can be viewed by following the source link below.